I am very happy to share the announcement about my first novel with Bold Strokes Books. I’ve been a fan of several of their writers; Radclyffe, Carsen Taite, Kim Baldwin and VK Powell wrote some of the first lesbian fiction titles I’d ever read. As I began looking for more books to pick up, I found that many of the stories I was drawn to were published by Bold Strokes Books. I could not be more excited to be part of such a supportive and talented group of writers and editors. I’ve been anxious to talk about the first book, but reluctant to do so until the official release date had been set. That date is May 2015 and the title of the book is All Things Rise. The title is a bit of a homage to a book I’ve always referred to as a personal favorite by Flannery O’Conner titled, Everything That Rises Must Converge. I originally got the idea for this first novel about two or three years ago. For me, an idea shows up and then just kind of ferments in my head… sometimes for quite some time. In this case, after thinking about the story for a couple of years it just suddenly all came together and I felt compelled to get it on paper. 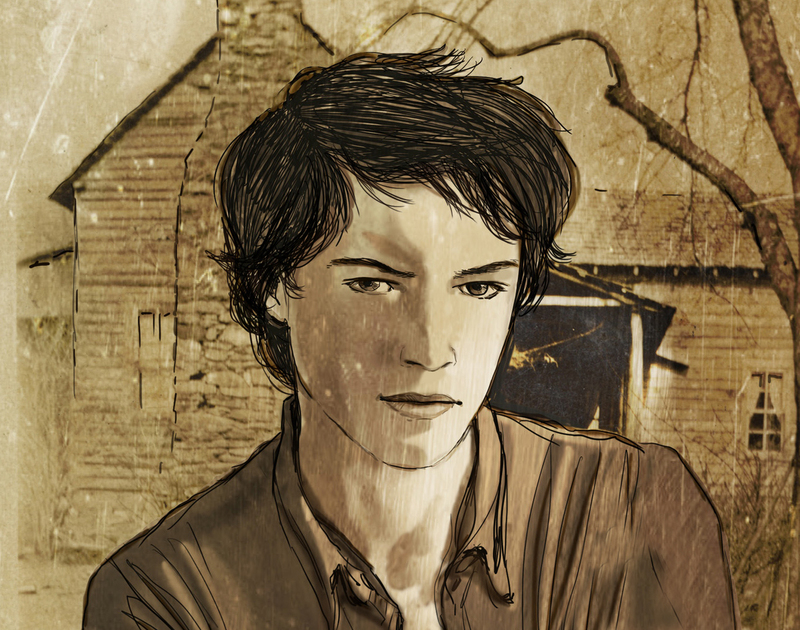 Cole, one of the main characters in my debut novel with Bold Strokes Books titled, All Things Rise. In addition to writing, I also do art for a living. Part of the creative process for me is fully rendering each character in my head, which sometimes manifests into an actual drawing. I created the illustration above of one of the three main characters from All Things Rise. Her name is Cole, short for Ruth Coleman George. The building in the background of this portrait is actually lifted from a photo of my great-grandparents’ house in rural Georgia. The photo of the house was originally taken in the early 1900s. There’s always a small risk in creating a picture of a character rather than letting readers create their own image of that character in their heads. Hopefully a good number of people will like this illustration and want to know more about her. Cole rescues Ava, a pilot from the Cloud City of Easton who crash-lands near her farm, setting in motion events that will alter the course of her life. It’s a hundred years after peak oil and the rich have risen above the Earth, inhabiting great Cloud Cities, while those left behind live a rural existence, off the grid. After suffering a vicious attack, Cole is transported to the Cloud City of Easton for emergency surgery. While recuperating and adrift in the unfamiliar social landscape of Easton, Cole begins a journey of discovery. When she meets Audrey, a beautiful doctor, the attraction they share is penetrating and possibly life altering. Explosions, staged by a ruthless underground movement, nearly bring Easton to the brink of collapse. The crisis that rocks the city forces Cole and Audrey to weigh what truly holds meaning, and what each is willing to sacrifice for love. I can’t wait to read it, sounds interesting already! I really like your artwork too. I’ve always thought a blend of drawing and photos to be more … dimensional than just photos or artwork alone. Would be great if BSB uses this as the cover, wouldn’t it? It would definitely stand out on a shelf! Thanks! Glad you enjoyed my artwork. I look forward to your thoughts on All Things Rise. Can’t wait to read. Congrats! Thanks, Erin and Kat! Really appreciate it. Looking forward to hearing your thoughts on All Things Rise.